Srinagar, Mar 21: One-way traffic was resumed on the national highway, the only road connecting Kashmir valley with rest of the country and traffic will ply from Jammu to Srinagar for the second consecutive day on Thursday. Meanwhile, fresh snowfall was received on the Srinagar-Leh national highway and historic 86-km-long Mughal road, connecting Shopian in south Kashmir with Rajouri and Poonch in Jammu region. Both the roads remained shut since December last year due to the accumulation of snow. However, authorities have already started snow clearance operation on both the roads to put them through later this month or early next month. Traffic on the Srinagar-Jammu national highway was suspended on Wednesday morning following fresh snowfall on both sides of the Jawahar tunnel, Shaitan Nallah and Banihal besides landslides and shooting stones at Penthyal and other places between Ramban and Ramsu, a traffic police official told TNN. He said the Border Roads Organisation (BRO) and National Highway Authority of India (NHAI) had immediately put sophisticated machines into service to clear the highway. 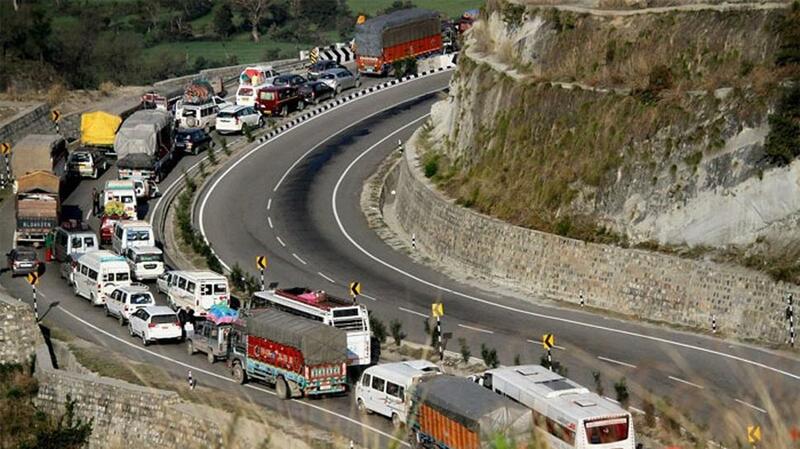 All the vehicles, which had left Jammu on Wednesday morning were stopped at several places, including Udhampur, Chanderkote, and Ramban. Later in the evening stranded Kashmir bound vehicles were allowed to move, he said adding for the second day today traffic was allowed to ply from Jammu to Srinagar. However, no vehicle will be allowed from the opposite direction, he said. Due to frequent suspension of traffic on the highway, people who are entirely dependent on imports from other states are facing an acute shortage of essentials. The prices of fresh vegetables besides chicken and meat has witnessed a surge. Similarly, transport of apple from Kashmir to different mandis of the country has been affected.